Synthetic peptide corresponding to beta Actin aa 1-14 (N terminal) conjugated to Keyhole Limpet Haemocyanin (KLH). Slightly modified ß-cytoplasmic actin N-terminal peptide, Ac-Asp-Asp-Asp-Ile-Ala-Al?a-Leu-Val-Ile-Asp-Asn-Gl y?-Ser-Gly-Lys, conjugated to KLH. N-terminal of the beta isoform of actin. ICC/IF: SV40LT-SMC cells WB: HAP1, HeLa, Jurkat, A431, HEK-293, COS-7, NIH/3T3, PC-12, Rat2, CHO, MDBK and MDCK cell lysates. IHC-Fr: Human stomach tissue. ICC/IF: SV40LT-SMC cells. Immunofluoresence staining of chicken gizzard ultra-thin sections (North et al. J. Cell Sci. 107:445-455 (1994)) labels the dense bodies, longitudinal channels and membrane associated dense-plaque. Purified from hybridoma cell culture. Our Abpromise guarantee covers the use of ab6276 in the following tested applications. WB 1/5000 - 1/16000. Predicted molecular weight: 42 kDa. Lanes 1 and 2: Merged signal (red and green). Green - beta actin, ab6276 observed at 42 kDa. Red - loading control, ab181602 observed at 37 kDa. 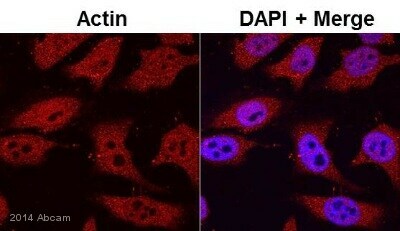 Ab6276 was shown to specifically react with beta actin in wild-type HAP1 cells. No band was observed when beta actin knockout samples were used. Wild-type and beta actin knockout samples were subjected to SDS-PAGE. ab6276 (beta actin) and ab181602 (loading control to GAPDH) were diluted 1/5000 and 1/10 000 and incubated overnight at 4°C. 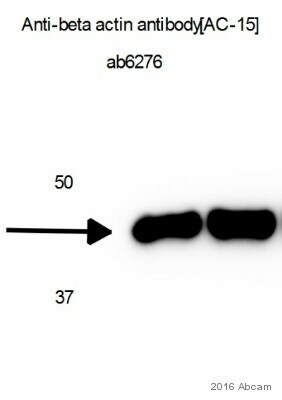 Blots were developed with Goat anti-Mouse IgG H&L (IRDye® 800CW) preadsorbed (ab216772) and Goat Anti-Rabbit IgG H&L (IRDye® 680RD) preadsorbed (ab216777) secondary antibodies at 1/10 000 dilution for 1 h at room temperature before imaging. ab6276 staining beta Actin in SV40LT-SMC cells. The cells were fixed with 4% formaldehyde (10 min), permeabilized in 0.1% Triton X-100 for 5 minutes and then blocked in 1% BSA/10% normal goat serum/0.3M glycine in 0.1% PBS-Tween for 1h. The cells were then incubated with ab6276 at a working concentration of 5μg/ml and ab190573, Rabbit monoclonal [EP1332Y] to alpha Tubulin (Alexa Fluor® 647, shown in red) at 1/250 overnight at +4°C, followed by a further incubation at room temperature for 1h with an anti-mouse AlexaFluor® 488 (ab150117) at 2 μg/ml (shown in green). Nuclear DNA was labelled in blue with DAPI. Immunohistochemical frozen analysis of acetone-fixed human stomach tissue labeling beta Actin with ab6276 at 1/5000 dilution,followed by secondary antibody. Western Blot of ab6276 (used as loading control) with whole tissue lysate of grey matter from BA20 (temporal cortex). Ab6276 was diluted 1/50000 and incubated with the sample for 16 hours at 4°C. 5 µg of lysate was loaded onto the gel, which was blocked with 5% milk for 1 hour at 20°C. 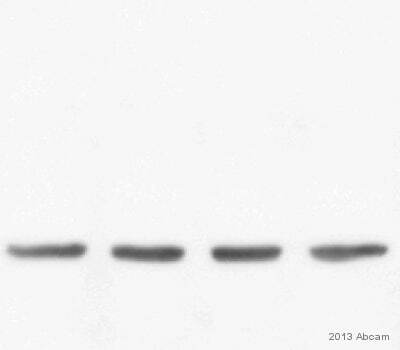 An Alexa Fluor® 680 conjugated goat anti-mouse antibody, diluted 1/5000, was used as the secondary. Bands below actin in image are synaptophysin (SYN). Western blot - Anti-beta Actin antibody [AC-15] (ab6276)This image is courtesy of David Grimm, Yale University, USA. MDCK cells induced with increasing amounts of doxycycline to control expression of the gene of interest. All cells were normalized for loading with an albumin protein standard assay. Anti-beta actin (ab6276) was used at a concentration of 1:5000 in a milk blocking solution. B-actin blotting confirms the albumin assay in showing that an equal amount of lysate was loaded in each lane. MDCK cells induced with increasing amounts of doxycycline to control expression of the gene of interest. All cells were normalized for loading with an albumin protein standard asssay. 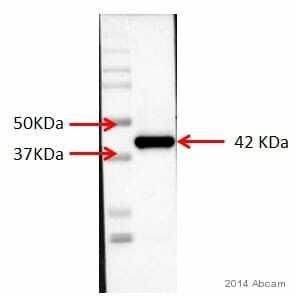 Anti-beta actin (ab6276) was used at a concentration of 1:5000 in a milk blocking solution. B-actin blotting confirms the albumin assay in showing that an equal amount of lysate was loaded in each lane. Publishing research using ab6276? Please let us know so that we can cite the reference in this datasheet.